About one year ago, I took an online quiz put together by the folks at Reason and discovered that Ron Paul was closest to my views. 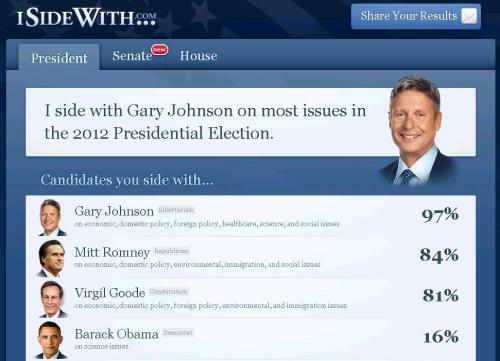 Not that I was terribly surprised, though I confess that I don’t remember if Gary Johnson was part of the quiz. And, if so, whether there were any differences between him and Ron Paul. Speaking of Gary Johnson, I just took a quiz at the ISideWith website and it tells me that Gary Johnson shares 97 percent of my views. That’s not a big shock, but I was surprised that the poll says I’m more Republican than Libertarian. Methinks the people who put together the poll must be high on crystal meth. Yes, I’m probably a bit more conservative than the average libertarian on issues like terrorism and immigration, but I’m a far, far stronger advocate of limited government than the average GOPer. But I gather the poll probably matches your views with the rhetoric of various candidates and parties, not their actual records. And the gap between Republican rhetoric and Republican performance probably explains why just about every prominent libertarian is ignoring the GOP and voting for Gary Johnson, according to this survey by Reason. Unless, of course, they think voting is a waste of time. P.S. In the for-what-it’s-worth department, the ISideWith people report that Gary Johnson’s views attract majority or plurality support from voters in South Carolina, Georgia, Florida, Alabama, Mississippi, Louisiana, Oklahoma, Arkansas, Texas, Arizona, Utah, Idaho, and Nevada. P.P.S. Mitt Romney’s views don’t have majority support in any state. P.P.P.S. Since the United States is supposed to be a constitutional republic rather than a majoritarian democracy, I don’t like any group of voters having the power to muck up my life. Dan Mitchell is a senior fellow at the Cato Institute. He blogs at International Liberty. His posts are republished here from time to time with his express permission. He gives this site a touch of class. America’s challenges and the crises we face demand a real debate — not dueling Phil Donahue acts carping at one another over who is worse. I defy anyone who watched the debate to identify a plan from either the Republican or Democrat that will achieve a balanced budget. Behind the fuzzy math and the quibbling, there was nothing more than a commitment to continue the status quo — with at most a few minor adjustments. We don’t need adjustments. We need a fundamental reduction in the role and cost of government, and both Romney and Obama are fundamentally big-government guys. We watched a blame game over immigration, while the problem festers with no solution in sight. We heard quibbling over whose government plan would have saved GM better, but nothing about why the government should be bailing out any company at all. And we heard cheap shots about government-run health care from two candidates who both support it. Where is the reasonable argument that government shouldn’t be running health care in the first place? On the attacks in Libya, the debate we must have is not over what we call it or when; we need a debate over why we were there at all. There are clear choices in this election, but they weren’t on the stage tonight. Here at WhatWeThinkandWhy we don't spend too much time on politics. At least not politics of the electoral variety. I'm sure that comes as a surprise to many who stop by here on a casual basis. It sure looks like this is a political site at first glace. We bash Obama and other statists here on a regular basis. Not because it will change anyone's mind about them, but mostly because it's really fun to pimp the knee-jerk Dems who think they are morally superior to everyone who isn't a liberal. So if we regularly piss off the liberals and the conservatives, that only leaves the libertarians in the "Not so pissed off" column. Just for the record, I'm not nearly pure enough of a libertarian to keep all those in that movement happy either. It's a wonder that anyone reads these essays anymore. And yet, readership continues it's steady expansion. While we have done almost nothing to encourage liberals, we have thrown some bones to the conservatives over time. (Dammit, life is just so unfair.) For instance, I have endorsed voting for Romney in certain circumstances even though it pains me intensely to do so. If you live in a "battleground" state, you can be forgiven, or even encouraged, to vote to dismiss Obama. His administration has been a flop. Dare I say a catastrophe? So he must be given a Presidential pink slip. Don't feel too sorry for the mope, under his leadership millions of people have been given undeserved pink slips. He certainly deserves his. It's all about the electoral college. So if you live in a state that is even within 10 percentage points of being contested, you owe it to yourself and your offspring to throw the bums out. And that includes Obama crony Ben Bernanke who is debasing our currency as never before. If that doesn't stop (and even if it does), your life savings might be reduced to Wiemar Republic status, maybe even before the 2016 election. If you live in any state that is "safe" for either candidate, and you value your future freedom and money, you would be a fool to vote for anyone other than Gary Johnson. If every freedom loving Republican, Independent, and rational moderate Democrat in California and Illinois, for example, voted for what they really want, Johnson would garner millions and millions of votes without risking the re-election of Barack Carter. If you don't think that would give you better choices in the next election from both major parties, well, you're wrong. It would move the parties in the freedom direction more than anytime in history. So I'm calling for all my friends in Illinoistan to make a real difference. Because you literally cannot have an electoral impact on our society by voting for Romney here. None. He is a really nice man who is competent in almost everything he does. He is a moderate on almost everything political. He is a big believer in government solutions to societal problems. He is the author of Obamacare whether Republicans want to admit it or not. Democrats know it in their heart of hearts. He supported the government bailouts. He supports government intervention in almost any problem although he thinks Republicans have the best intervention schemes. I dare say, if Romney was the Democratic nominee he would win this election in a landslide over almost anyone the Republicans could put up. BTW, regular Republicans would demonize Romney as a liberal, flip flopper and run as hard as they could against him if he was the Dem candidate. Same positions, wrong party affiliation. Independents, who actually decide who the President will be, would vote for him in droves. They probably will anyway. Roman Catholic Democrats may very well vote for a Mormon (of all things) to support their church against the onslaught of left wing crazies in their own party. And they can rightfully feel good about it. So there you have it on the title of this post. Now that the people have finally wised up and figured out that Romney is a Democrat, they are switching over pretty quickly. The polls, even though they are rigged by the left leaning pollsters, are showing the movement very clearly. And barring some unbelievably stupid misstep in the remaining debates or over last few weeks of the campaign, Romney will win. But if the rational libertarian former GOP Governor of New Mexico, Gary Johnson, doesn't get sufficient support in the election, the country itself will lose again, because next time out you will get the same crummy choices the two parties always give you. And time has just about run out on this experiment. Today's post is about a subject that I have been harping on for a few decades, mostly to friends who were looking at me sideways while only pretending to listen to my warnings, for the umpteenth time. You see, I am convinced that the government will not default on it's obligations, ever. At least not in the usual sense. Anyone who has an inkling of the size of the obligations that are coming due can tell you that in the real world these debts cannot be paid. Except of course if they "make good" on them with money that is worth a fraction of what it's value was when the obligations were assumed. Economists call it monetizing the debt. I call it stealing. So I'm convinced that is how they will pay in the end. It's the only way out if you have spineless politicians who refuse to enact any real reforms. Today's post is republished here, and on our history website Cheeky History, (it is history after all) with the permission of the author and UBS Corp. who holds the copyright on his work. It is an excerpt from "Cashin's Comments", a highly sought after daily market letter. Mr. Cashin is eminently qualified to teach us something about the future by referring us to the past. I hope you find it educational. Originally, on this day in 1922, the German Central Bank and the German Treasury took an inevitable step in a process which had begun with their previous effort to "jump start" a stagnant economy. Many months earlier they had decided that what was needed was easier money. Their initial efforts brought little response. So, using the governmental "more is better" theory they simply created more and more money. But economic stagnation continued and so did the money growth. They kept making money more available. No reaction. Then, suddenly prices began to explode unbelievably (but, perversely, not business activity). So, on this day government officials decided to bring figures in line with market realities. They devalued the mark. The new value would be 2 billion marks to a dollar. At the start of World War I the exchange rate had been a mere 4.2 marks to the dollar. In simple terms you needed 4.2 marks in order to get one dollar. Now it was 2 billion marks to get one dollar. 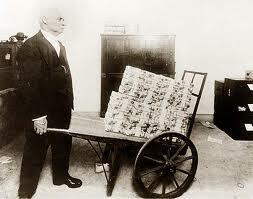 And thirteen months from this date (late November 1923) you would need 4.2 trillion marks to get one dollar. In ten years the amount of money had increased a trillion fold. 22 cents. By 1919 it was 26 cents. Now the fun begins. When things began to disintegrate, no one dared to take away the punch-bowl. They feared shutting off the monetary heroin would lead to riots, civil war, and, worst of all communism. So, realizing that what they were doing was destructive, they kept doing it out of fear that stopping would be even more destructive. Currencies, Culture And Chaos – If it is difficult to grasp the enormity of the numbers in this tale of hyper-inflation, it is far more difficult to grasp how it destroyed a culture, a nation and, almost, the world. People’s savings were suddenly worthless. Pensions were meaningless. If you had a 400 mark monthly pension, you went from comfortable to penniless in a matter of months. People demanded to be paid daily so they would not have their wages devalued by a few days passing. Ultimately, they demanded their pay twice daily just to cover changes in trolley fare. People heated their homes by burning money instead of coal. (It was more plentiful and cheaper to get.) The middle class was destroyed. It was an age of renters, not of home ownership, so thousands became homeless. But the cultural collapse may have had other more pernicious effects. Some sociologists note that it was still an era of arranged marriages. Families scrimped and saved for years to build a dowry so that their daughter might marry well. Suddenly, the dowry was worthless – wiped out. And with it was gone all hope of marriage. Girls who had stayed prim and proper awaiting some future Prince Charming now had no hope at all. Social morality began to collapse. The roar of the roaring twenties began to rumble. All hope and belief in systems, governmental or otherwise, collapsed. With its culture and its economy disintegrating, Germany saw a guy named Hitler begin a ten year effort to come to power by trading on the chaos and street rioting. And then came World War II. We think it’s best to close this review with a statement from a man whom many consider (probably incorrectly) the father of modern inflation with his endorsement of deficit spending. Here’s what John Maynard Keynes said on the topic: By a continuing process of inflation, governments can confiscate, secretly and unobserved, an important part of the wealth of their citizens. By this method they not only confiscate, but they confiscate arbitrarily; and, while the process impoverishes many, it actually enriches some…..Those to whom the system brings windfalls….become profiteers. To convert the business man into a profiteer is to strike a blow at capitalism, because it destroys the psychological equilibrium which permits the perpetuance of unequal rewards. Lenin was certainly right. There is no subtler, no surer means of over-turning the existing basis of society than to debauch the currency. The process engages all the hidden forces of economic law on the side of destruction, and does it in a manner which not one man in a million is able to diagnose….By combining a popular hatred of the class of entrepreneurs with the blow already given to social security by the violent and arbitrary disturbance of contract….governments are fast rendering impossible a continuance of the social and economic order of the nineteenth century. Many thanks to Mr. Cashin and UBS Financial Services who graciously allow his historical musings to be republished on our sites. To enjoy more of Art's posts simply visit Cheeky History and click on "Cashin's Comments" in the label section on the sidebar.